FocusParameterMonitor - Laser Beam Diagnostics - Laser Mechanisms, Inc. The PRIMES FocusParameterMonitor (FPM) enables rapid determination of laser beam parameters. The measuring processes are completely controlled from the existing machine programs. 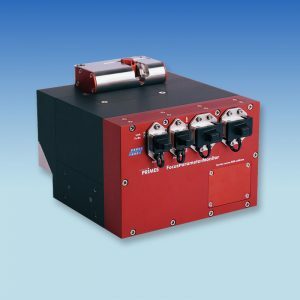 The FocusParameterMonitor (FPM) is the first system on the market that allows quick determination of the laser beam parameters in the process zone. Its advantages: It can easily be integrated into the system, and moreover the fieldbus interface (PROFINET, PROFIBUS) provides easy connection to many industrial control systems and networks. At the beam inlet, an electrical closing device and a protective glass protect the measuring device from contamination. The beam coming from the laser and the processing head is directed into the device via a deflecting mirror. The beam reaches the measuring components via a beam splitter and a further deflecting mirror. The laser power is measured calorimetrically. For this purpose the laser irradiates the absorber for a defined period. With the help of the known heat capacity, the temperature increase in the test body and the irradiation period, the power is calculated. The camera-based beam analysis unit measures the beam geometry and beam position with a CCD sensor. A fieldbus interface lastly forwards the measurement data data to the system controller. An additional PC is not required. The FPM can be mounted either horizontally or vertically. Because of the risk of dirt contamination, vertical fastening with horizontal beam incidence is recommended. Its use is fully automatic. Due to connection to the machine controller, the measurement processes can be completely controlled from the existing machine programs. The fieldbus system performs this communication. For both models of the FPM, a fieldbus interface (PROFIBUS, PROFINET) can be selected. All models are fitted with a replaceable protective glass. An option is currently under development to allow the output of the measured light density distribution via fieldbus systems also.